It wouldn't be Thursday without a guest blogger and today's post is simply amazing.... inspiring...beautiful. 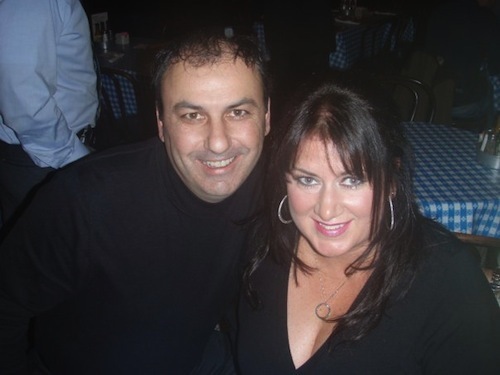 Bev and Vasile are so brave to share their story. Grab a tissue and read on! Bev: It was February 2003 and I was coming off an emotional hangover bred out of a bad divorce a year earlier and a subsequent love relationship that had ended abruptly after almost a year of dating. This left me devastated, heavy hearted and disillusioned. I struggled with my emotional deficits and cynicism. All that negativity also lead me down a path of unhealthy living. I spent the next year in a bad pattern of self destructive behavior…..eating a diet of processed foods, fat and sugar and smoking and drinking with reckless abandon. By early Fall of 2004 I started to realize that if I didn’t change my attitude and lifestyleI was heading down an irreversible path of destruction. I immersed myself in the art of meditation and took a series of life changing classes that led to my certification as a Reiki Master. With a newly open heart, I attended a Halloween party of a friend of mine. It was a night that would change the course of my life forever. It was there I met my Romanian Prince Charming. My tall, dark and handsome stranger, who swept me off my feet and infused my stone cold heart with unconditional love. We married in 2007 on a beach in Cozumel among our closest friends and family. My life was perfect in every way I had ever imagined. All of the disappointments were replaced with hope of a better future. Fast forward 2 years of wedded bliss later, it's December 12th of 2009 and I have an intense and disturbing nightmare that my husband had a heart attack. Two days later my husband calls me while I'm out shopping to say he is not feeling well. I flash back to the nightmare and calmly tell him I am returning home to pick him up to take him to the hospital. Surprisingly, he doesn’t fight me on this, and an hour later, my husband is in the emergency room fighting for his life. The diagnosis---massive heart attack at age 44. Had I not gotten him there so quickly he would not have made it. After he was rushed into surgery they discover several severe blockages in his main artery. Several stints later, we are in shock. How could this happen to someone so young? We left the hospital knowing that some significant life changes are necessary. We introduced some fruits and veggies, got in a little exercise and with his prescribed medications, we hoped for the best. What we didn’t do was eliminate the fat, sugar and processed food. A year later, in November 2010, my husband feels tired and run down. Test results indicate some possible issues so another heart cath is scheduled. During the proceduretwo additional stents are placed in the same artery. Panic now sets in. How can this be?How did we get to this place again after only one year?? I put the fear aside, and started my search for answers. I came across a book, Prevent and Reverse Heart Disease by Dr. Caldwell B. Esselstyn and realized that a new approach to the way we ate was is necessary to give my husband the best chance of survival. The premise of Dr. Esselstyn's book is simple: Eat a plant based vegan diet. Eliminate ALL fat (yes, even the “good fat”) and follow a healthy lifestyle that excludes processed foods, sugar, white flour, dairy or meat products. I then scoured the internet for Vegan tips and recipes to inspire us on our journey. One particular blog I stumbled across became the lifeline we needed to get through the hurdles of learning what and how to cook: Happy Herbivore.This blog inspired us with so many amazing recipes and tips on preparing Vegan food that was not only healthy but delicious. 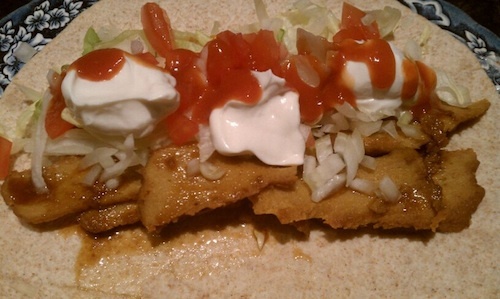 A picture of our favorite HH meal... Seitan Carnitas! I am over the top in love with these things. I could eat them every day! Happy Herbivore also fit our Fat Free mantra which was essential to following Dr. Esselstyn's protocol for a healthy heart and reversal of heart disease. When Lindsay announced she was introducing a cookbook, I immediately jumped on my Ipad and downloaded it. Another home run. Astoundingly delicious fat free/low-fat recipes that fit our needs perfectly!! For the next 3 months after all that, we followed the Vegan plan, got our weekly exercise and enjoyed our newfound energy and calm demeanor. What happens next is beyond astounding. Less than 3 months later, in Jan. 2011, my husband had his cardiologist follow up visit. His blood results and medical stats come back, and Vasile’s doctor was astounded. He wanted to know what in the world my husband had done. He had lost 20 lbs in less than 3 months, and his cholesterol had dropped 45 points.It is the Vegan lifestyle, he tells the doctor! I had also lost 15 lbs since going Vegan and have never felt better physically or emotionally. In anticipation of my husband's fabulous lab results, we brought a copy of Lindsay’s book, The Happy Herbivore, to our office visit. We wanted to share this amazing journey with his cardiologist in hopes that he might educate other patients about the virtues of a Vegan lifestyle and that it can offer life changing results both physically and emotionally. Lindsay’s book just illustrates the fact that just because you are Vegan does not mean you have to eat boring or bland food or give up good taste or creativity! We encouraged him to share our success story with his patients! 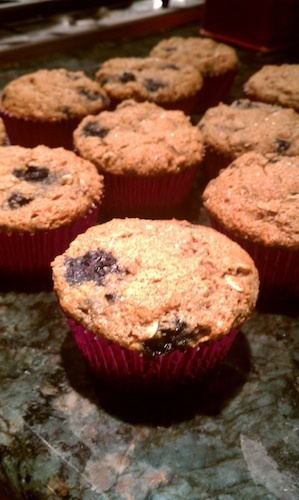 Our favorite HH dessert...Blueberry Oat Muffins (p. 42) of The Happy Herbivore Cookbook. Since that office visit and confirmation of success, we have been collecting various recipes and trying new and different things out. We have educated many of our family and friends to the fat free/low-fat vegan lifestyle and we recently started a blog, Hearth Healthy Vegan. 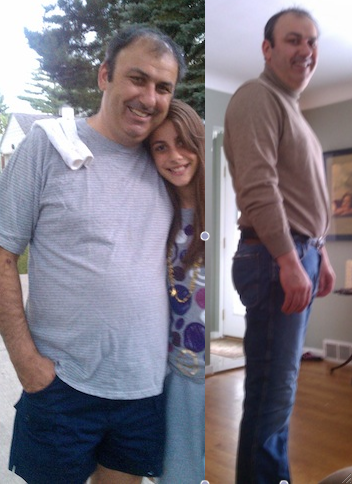 They say that everything happens for a reason, and although Vasile’s heart disease diagnosis was devastating, we feel so empowered by the choice we made to change our life and dedicate ourselves to a Fat Free Vegan Life. Not only are we both healthier and happier, but we are making a difference in the world by choosing this lifestyle. We have also made amazing connections with so many like minded people, and it has affected our personal and professional lives in such a positive way! We are excited about continuing to educate others about the positives that come from being Vegan and hope to continue to collaborate with Vasile’s cardiologist to help inform his patients and the people we touch in our daily lives about the benefits of being a Vegan. Thank you Lindsay for being such an important part of our journey! Our first marathons! 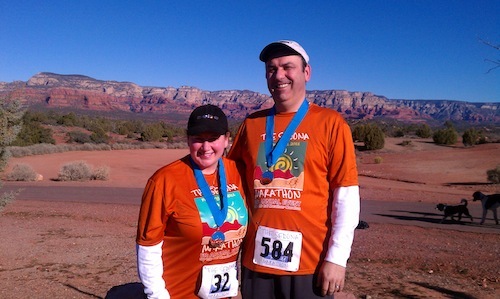 Sedona Marathon Feb 2011! Happy Herbivore:Thank you both for sharing your emotional story and journey to health with us! I feel so bless to be a part of it! Wishing you much love, happiness and good health for many years to come! How has eating a healthy diet changed your life?